The idea behind this tutorial is to introduce you quickly to the major capabilities of GeoGebra, and give you the tools to explore the details on your own. As much as possible, I'll try to move from basic to more advanced, emphasizing the features most commonly used. I assume you have downloaded GeoGebra from www.geogebra.org and have it set up on your computer. The official GeoGebra help document is here. As you go through these tutorials, feel free to experiment, get off track, and "kick the tires." This is for you, after all! 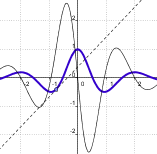 The GeoGebra User Forum - accessible from the above page, but worth noting as a great source of help. The official help document for GeoGebra 3.2.